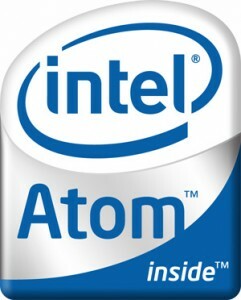 As a follow on effort to promote its latest Atom processor, Intel has just released a new Mini-ITX standard platform powered by Atom 230. Named as D945GCLF, the platform is powered by Atom 230 clocking at 1.6GHz, paired with both northbridge 82945GC GMCH and southbridge ICH7 which offer three chip solution with enhanced peripherals support for various kind of applications. As differs from Intel’s Z-series Atom processor that paired with Poulsbo chipset, the Atom 230 seems to be able to offer more features with dedicated northbridge and southbridge support. Some of the great features include the DDR2 DIMM memory support up to 2GB running at 533MHz or 667MHz, PCI slot, SATA (Serial ATA) interfaces as well as PATA (Parallel ATA) for external hard disk or optical drive connectivity. That is not all, it has been integrated with 10/100 Ethernet port and VGA Video port for external display. One similarity, both Z-series and 230 paired chipset have integrated GMA950 graphics core that can offload some of the graphics intensive application from CPU core for other important tasks. With all these features sets in place, the platform is claimed to be thermally efficient, by able to maintain within 12 Watt to 29 Watt power windows (depending on feature sets), that make it suitable for industrial or even consumer usages. The whole platform is selling for around $80, almost three times of the processor selling price of $30. This cost is quite reasonable in viewing of all those integrated features provided by the total platform. But bear in mind that it is only targeted for OEM and the end products (nettop and entry level UMPC) are expected to be sold around $200-300.